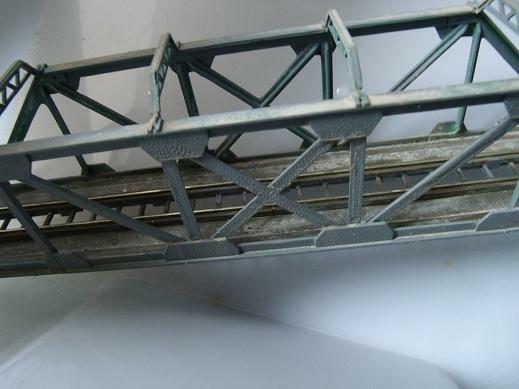 In response to Juergen asking me to show my wet weathering, I thought I would show my girder bridge done that way. Initially I prime/undercoat with acryllic, preferably grey as it sticks best. This time I ran out so used some dark green. I then paint over with emulsion paint , although acryllic works just as well . Depends what you can get hold of. As I have been painting a few models, I have some liquid gunge, so aplu some with any old brush. If there is not enough paint in it, I add a dab of grey emulsion, then wash it down before it dries. Model is in position it would expect to be so gravity will take water to cracks as it would in reality. If it does not look quite right, I just add more gunge and spots of paint, till I am happy. To get better rust effect, I think you need some way of engraving the surface, and I have not tried that. 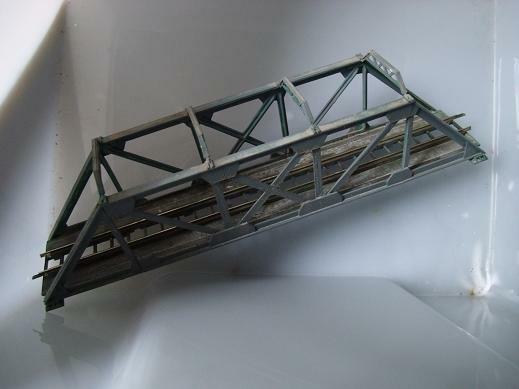 I am thinking that painting with a decent thickish coat of grey acrylic, leaving it to dry, then trying to scratch some off might be a start, then wet weathering on top of that. Liquid glue might also etch the plastic. Liquid glue on top of acrylic paint can erode the paint as it is a solvent for the acrylic paint(having cleaned up paint dried brushes that way). As I said, nothing wrong in buying specialist paints and weathering stuff, but it can be done using left overs, and cheap water based paint. For me availability is just as important as cost.